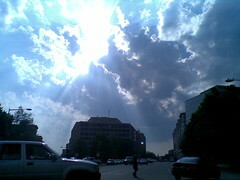 At top left, crepuscular rays from the sun shining through clouds over Pennsylvania Ave NW. 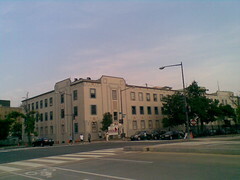 At top right, CCNV, the largest homeless shelter in DC. Below that, the scene from Lafayette Park looking across Penn Ave towards the White House, with the usual spectacle of tourists and protestors.